"Kent State - Jackson State: 20 Year Retrospective"
Andrea Stone, "The Pain of Kent State 20 Years Later," USA Today, April 24, 1990, Sec. A, Pg. 1. Light pierces the bullet hole in the abstract sculpture near Taylor Hall at Kent State University. For 20 years, the committed and the curious have peered through the hole, hoping for a glimpse of history. So many have come that they've worn a rut two feet deep at the sculpture's base. But that small gulley is nothing compared with the psychic chasm that opened across the nation on May 4, 1970, when National G uardsmen - called in to quell violence after a weekend of protest over the U.S. invasion of Cambodia - fired past the sculpture at students. Four died, nine were wounded. This May 4 - amid 58,175 yellow daffodils planted on Kent's campus to commemorate Vietnam War dead - thousands will come to remember. Already the media onslaught has begun. Television crews daily traipse up and down Blanket Hill, where the shootings occurred. Kent's six hotels are booked solid. "Kent State was a touchstone, a watershed event just like the Kennedy assassination was a generation earlier," says J. Gregory Payne, author of Kent State: 13 Seconds and a Generation Later. "It signaled to some people that it was never going to be good again." Twenty years later, it is still a controversy. Payne and others, including then-Sen. George McGovern, will dedicate a new memorial to "the events of May 4, 1970." Some parents of victims, some of those wounded and some current campus activists say the monument is too small, too vague, too late. At least Kent hasn't been forgotten: A smaller ceremony will be held May 2 at Mississippi's Jackson State University, where - 11 days after Kent and to little public outcry - two black students were killed when police fired on protesters. Kent, from the moment the tear gas cleared, has come to mark the symbolic end of the angry '60s, the start of a decade that became the apathetic '70s. It touched off student unrest and strikes at campuses nationwide and has been credited with helping end the Vietnam War. H.R. Haldeman, White House chief of staff at the time, said in his book, The Ends of Power, it began Nixon's "downhill slide" into Watergate. Whatever history's verdict, the May 4 shootings shattered lives and transformed a generation. "It has been a long and difficult 20 years," says Alan Canfora, shot in the hand as he waved a black flag. Nine years of civil trials yielded $ 675,000 in damages for the victims and their families, plus Ohio's official statement of regret. Eight guardsmen were indicted, but the charges were dropped. That still burns Canfora, who, at 41, has turned those seconds of gunfire into a lifelong "necsession - an obsession born of necessity." Most, though, have moved on. "I was bitter for a while," says Dean Kahler, the most seriously wounded student, paralyzed from the waist down. "But I grew up learning you can't harbor hate. I think I've forgiven the people who pulled the trigger." Kahler, 39, is now an Athens, Ohio, county commissioner and recently married for a second time. It took James Russell 10 years to get over the shooting, which wounded him in the forehead and thigh. Now 43, he has finally settled down, working as a draftsman in Oregon. He recently told his 7-year-old daughter, Rebecca, about Kent. "She thinks it's horrible," he says. Joseph Lewis Jr., 38, lives near Russell and works in a water treatment plant. He tries to put May 4 in the past - until pictures bring it back. Then 18, he was the youngest student shot and, at 60 feet away, the closest to the guards. Lewis can still hear them "jostling and bumping into each other with their gas masks and equipment packs. They sounded like football players." In the end, Allison Krause, Jeffrey Miller, Sandra Scheuer and William Schroeder were dead. Krause and Miller were at the protest; Scheuer and Schroeder were walking to class. For their parents, there is only silence, though for a while the families were targets of verbal attack from critics of war protesters. "It changed my life completely. I became much more disillusioned and skeptical," says Elaine Holstein, whose son Jeffrey was 20. "The initial terrible pain, which was so awful for the first 10 years, has diminished so that there are times when I am happy. I am living my life." Living with different memories are the Ohio National Guardsmen. Called in during a violent weekend during which Kent State's Army ROTC building was burned, they used tear gas to disperse anti-war demonstrators from the school's Commons. Some students threw back gas canisters and heaved rocks. Why the guardsmen turned and fired is still in dispute. Some say there was sniper fire. Others say the shootings were part of a plan. That was the last heard from many of the soldiers. Most have sought self- imposed oblivion. Those who can be found hang up. Talking about Kent is "like trying to poke a stick into a wound that's healed," says Sylvester Del Corso, 77, former adjutant general of the Ohio National Guard. The wife of then-Sgt. Lawrence Shafer - the only guardsman to say he shot anyone, taking deliberate aim at Lewis as he gave them the finger - answers the couple's phone in nearby Ravenna. "He's not talking to anyone. He has no desire to. Thank you. Goodbye," she says. One guardsman's daughter, now a 23-year-old Kent State student, says none of her friends knows her father was there May 4. That's how she wants to keep it. Only Charles Fassinger, the top officer at Kent, publicly gives the guard's side. "There is no question in my mind ... those who said they were in fear of their life had every reason to believe that." Fassinger, now a Cleveland businessman, feels remorse, but not guilt. He says some good has come: Officials now talk about "confrontation management" instead of "riot control." Loaded weapons and bayonets have been replaced by shields, batons and other defensive gear. The university itself is still recovering. Enrollment, 22,500 this spring, is just now returning to 1970 levels after a 15-year decline following the shootings. "I just wish everyone would let it rest because it has nothing to do with me," says Brian Miller, 20, of Kent, whose grandfather fought the ROTC building fire in 1970. "People say (protest) didn't work then, it's not going to work now" and students should just concentrate on their careers, says Robyn Herr, 19, a student activist. Despite Kent's strict 1970 rules controlling campus demonstrations, Herr says activism is again growing, pointing to the blossoming environmental movement. Yet, to many people, Kent State will always mean one thing. "People either sing 'four dead in Ohio' (from Crosby, Stills, Nash and Young's song Ohio) or ask if I wear a bulletproof vest," says Dina Caccamise, 22, a senior in Kent's "May 4" class. In the for-credit class, given by two professors who were at Kent at the time, students learn about the shootings and the events leading up to and following them. Caccamise gets the "eeriest feeling" when she passes Taylor Hall at night. "I always get this chill up my back to think the government could end my life so easily." AMONG THE NINE INJURED: Former student Alan Canfora in front of the memorial at Kent State. 'It has been a long and difficult 20 years,' Canfora says. 'I'VE FORGIVEN': Dean Kahler, shown with former Guard officer Charles Fassinger, was paralyzed. "At Jackson State, an echo of violence," USA Today, April 24, 1990, Sec. A, Pg. 2. The shootings at Mississippi's Jackson State University still linger in the shadow of Kent State. Less than two weeks after Kent, two black students were killed and nine others wounded by state troopers on May 15, 1970. The incident started after student demonstrators, protesting the Vietnam War and seeking more rights at the historically black college, responded to an order to disperse by throwing stones and bottles. It ended as police opened fire outside a women's dormitory. Phillip Gibbs, 21, a junior preparing for law school, who had a child and a pregnant wife, and James Earl Green, 17, a high school track star on his way home from his job at a grocery store, were killed. A presidential commission later found the shootings at Jackson and Kent "completely unjustified." No one was indicted. "I didn't think anyone would be punished for it in the first place," says Nureen Gibbs Ray, Gibbs' sister. "They said there was an investigation, but I don't think there was ever anything concrete." Ray said Gibbs had called her that night to tell her about the disturbances on campus. He said he and their sister Mary, also a Jackson State student, would be leaving for their home in Ripley, Miss., about five hours away. The siblings' parents both were dead. "His car already was packed," Ray said. The shootings "were not that shocking because that goes on here all the time," says Gene Young, 39, an adjunct professor who was a Jackson State student 20 years ago. "It was one more racist act inflicted on blacks without the victimizers being prosecuted." J. Gregory Payne, who recently hosted a symposium on the Kent and Jackson shootings at Emerson College in Boston, agrees: "When two black students are shot in Mississippi, it's not news in the same sense as (the shootings of) four middle-class white students at a campus in Ohio." Andrea Stone, "Where wounded are now," USA Today, April 24, 1990, Sec. A, Pg. 6. Alan Canfora says it's "impossible to walk away from this issue." The founder of Kent May 4 Center has dedicated his life to ensuring the shootings aren't forgotten or repeated. Canfora, 41, supports himself by speaking to college students and is considering running for mayor of nearby Barberton, Ohio. John Cleary, 39, is an architect in Pittsburgh. The shootings made him "enjoy life a little bit more and realize (it) is very fragile." He met his wife, Kathy, at Kent's one-year anniversary; his son Andrew was born May 4. Thomas Grace, a social worker, 40, near Buffalo, remains politically active. He's president of his union and was a Jesse Jackson rules committee member at the 1988 Democratic convention. He's told daughter Alison, 9, about the shooting. "It was a little much for her to comprehend." Joseph Lewis Jr. regrets giving guardsmen an obscene gesture, saying it made him a target. The only wounded student not to graduate, Lewis, 38, met his wife, Galen Keller, during the students' failed 1975 civil suit. They and two sons live in Scappoose, Ore., where Lewis a water treatment plant operator and tends apple and pear trees. Donald Scott MacKenzie, 41, was a high school industrial arts teacher in Laramie, Wyo., until dropping from sight recently. Earlier, he ran a custom wood shop in Colorado and spent 1 1/2 years at a yoga retreat. James Russell couldn't hold a job for nearly 10 years after he graduated from Kent. He says he was fired from a department store after his boss found out he was at Kent. Now a draftsman in Deer Island, Ore., --Russell, 43, is married, has a daughter, but is still bitter: "The whole massacre was covered up." Robert Stamps, 39, earned a master's degree from Kent in 1975. He now helps set up drug and alcohol treatment programs and teaches sociology at the University of La Verne in San Diego. Douglas Wrentmore, 40, lives with his wife in Eldridge, Iowa. He has worked as a social worker and run a mail-order business from home. He has kept a low profile since being wounded in the leg and has refused interviews. In 1979, she married plumbing contractor Joe Gillum in Las Vegas. She was reported in Kentucky in 1981, but has dropped from sight, now possibly back in Florida. 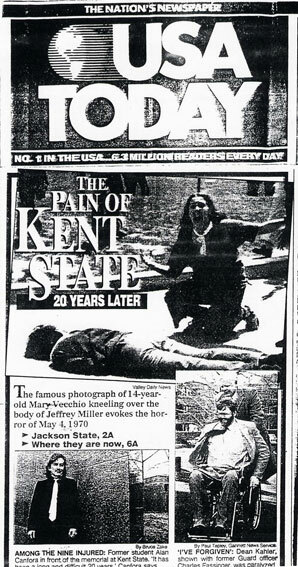 Lisa Faye Kaplan, "Guardsman, victim talk about Kent State," USA Today, April 24, 1990, Sec. A, Pg. 6. On May 4, 1970, Dean Kahler and Charles Fassinger met on a grassy hillside at Kent State University. Kahler, a 6-foot-3 farmboy with flaming red hair, was 20 and a first- semester freshman. Charles Fassinger, 39, was married with three children, and a lieutenant colonel in the Ohio National Guard, commanding the second squadron of the 107th Armored Cavalry. In the last 20 years, Kahler and Fassinger have told courtrooms and commissions what they think led to the Kent State shootings, which left four students dead and nine wounded. Kahler: The day was cool but very sunny. I knew there was a rally at 12. I had a 1: 10 class, so I took some papers with me. Fassinger: I was commander of troops, responsible for those guardsmen. Whether the rally was to be allowed was not my decision. It was about 11: 20 when I got a phone call at headquarters. The noon rally was not to be allowed. It would be dispersed. Kahler: I went to the rally out of curiosity. I figured there would be speakers. I wasn't there to protest the Guard. I was going to protest the invasion of Cambodia. I was getting bored. It wasn't meeting my expectations of what a rally should be. Fassinger: I was watching. If it was just a group of peaceful students getting together, rules or no rules, we're not going to do anything about it. However, there was a gradual change. The decision was made that a Kent security officer should get on a bullhorn and read the Riot Act, a proclamation saying campus rallies were banned. The sound wasn't getting to the students. So the decision was made to take a Kent campus policeman, send him out in a jeep and read the same proclamation as he drove across that football field-sized Commons. Then the Guard came out with their jeep. Some students started throwing stones. A couple hit the jeep. Fassinger: We sent the jeep out again, but it barely reached the students when more stones were thrown and the security officer got hit. Fassinger: Tear gas seemed to be the right step to take next. It's not lethal. Kahler: Tear gas canisters landed right around where I was standing. My eyes were starting to water, my nose and ears burn. I remember going down the hill into the parking lot area, shaking my head and starting to regain my senses again. Kahler: I grabbed a handful of gravel and flung it at them. My thinking was, they'll stand there, shoot tear gas all afternoon. I'll get coffee on my way to my 1: 10 class. Fassinger: As we were moving back, many students followed, some directly behind. I was hit with a stone hard enough to knock me down. Kahler: I was on the football field, and there was nothing for me to hide behind. There was screaming, chaos. I felt a warm, stinging sensation, just like being stung by a bee only larger. I knew immediately I was shot in the back. I touched myself on my rear end and thighs, and there was nothing there. Fassinger: I gave the order, cease fire. The most dangerous time, in my mind, was when we got back to the Commons. The students were now irrational. I walked that line of some 90 guardsmen, told commanders to stand at ease. We aren't going to antagonize anybody. As they were slamming the door shut, one of the kids from my dormitory looked in and gave me the peace sign. Fassinger: I was brought up to believe that a commander was responsible for everything his troops did or failed to do. I kept wondering, was there anything I could have done that would have made any difference? Once the decision to disperse the crowd was reached, nothing I could have done would have changed anything. Kahler: I was very angry that they shot us. Nixon had set the stage. I held him directly responsible for my shooting. The doctors told me I'd probably be paralyzed for the rest of my life. (Fassinger folds his arms on his chest, and his eyes well with tears as he tells Kahler something he's wanted to share for 20 years). Fassinger: I agreed to this interview because of Dean. I wanted him to see and hear the Guard's perspective, who were people just like him. I knew what he had to go through. I've wished for some time that he understood where I was coming from at the time. Kahler: I've forgiven the Ohio National Guard troops who were on the line that day, anybody lower than a general. They didn't have direct responsibility. They were just pawns in this game. 1:00 - 2:30 - Panel: "The Temper of the Times: Student Unrest at Emerson and Elsewhere"
2:30 - 4:00 - Panel: "What Occured at Kent State and Jackson State: The Friction Between Fact and Fiction." Gene Young, "The History of the Shootings at Jackson State." Alan Canfora, activist wounded at Kent State, "Student Activisim From the 1960's to the 1990's"
Dr. J. Gregory Payne, author, "Kent State: 13 Seconds and A Generation Later"
4:00 - 5:30 - "Pursuing Justice at Kent and Jackson State"
Paul Keene, Kent State Alum and Student Leader in Petition Drive to President Nixon in 1970. Leo A. Zani, Aide to President Nixon during Kent and Jackson State investigations, "Inside the White House after May 4th." Sanford Rosen, San Francisco, Attorney for dead and wounded students at Kent State, "The Long Odyssey Toward Justice." Remarks: Senator John Kerry, Mass. 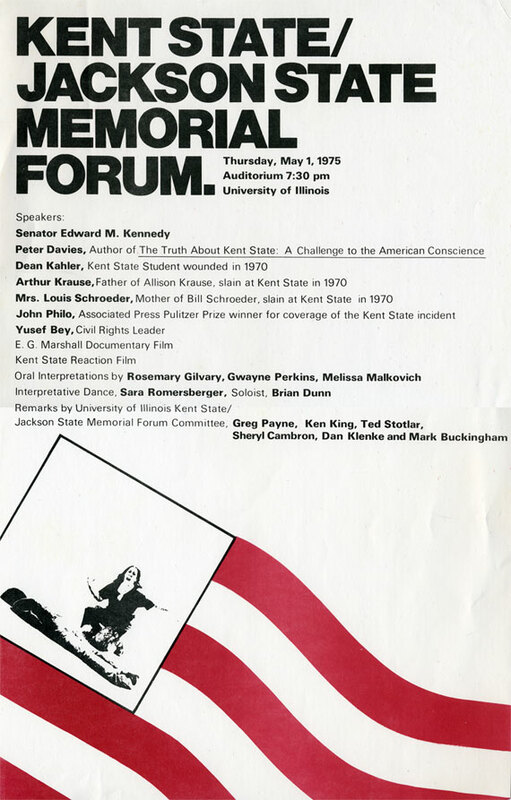 ; Mayor Ray Flynn, Boston; Rep. Patrick Kennedy, Rhode Island, "Senator Edward Kennedy's Pursuit of Justice at Kent State and Jackson State University: Just Saying No to the Justice Department's 'Eye's Only' Secret Memo"
Guests: James Goldstone, Emmy award winning director for NBC's "Kent State"; Senator Leo Gannon, R.I.; Alan Canfora, Student activist wounded at Kent State; Dean Kahler, paralyzed at Kent State; Sanford Rosen, Attorney for Kent State litigation; author Gene Young; Prof. James Golden; Ken Hammond, "Kent 25"; Frank Napal, Paul Keane, among others. 11:15 - Personal Rememberances: Inaction, Indictments, Trials and Settlements But Was Justice Served? Paul Keane, Kent State Alum and Student Leader in Petition Drive to President Nixon in 1970. Sanford Rosen, San Francisco, Attorney for dead and wounded students at Kent State. 1:30 - "Packaging People's Perceptions: Mediated Realities of Kent State and Jackson State." James Goldstone, Emmy Award Winning Director, NBC's "Kent State"
Prof. J. Gregory Payne, author and historical consultant for NBC's "Kent State." Prof. John Anderson, director, "Kent State: A Requiem." 2:45 - "A Tribute to Kent State" - Interpretative Dance, Washington D.C. Women's Dance Troupe. 3:00 - Commemorative Speech by Dr. James Golden, Ohio State "Kent State and Jackson State: Twenty Years Later What do They Mean to Us?" 3:45 - Open Forum - "Ethical and Historical Issues: Lessons to Be Learned From Kent State and Jackson State"
"Allison" by Peter Davies, Performed by Prof. Walt Littlefield and Marcie Littlefield.